The 2013 Tyler Prize for Environmental Achievement is awarded to Dr. Diana H. Wall, University Distinguished Professor and Director at the School of Global Environmental Sustainability, Colorado State University. She also holds appointments as Professor of Biology and Senior Scientist at the Natural Resource Ecology Laboratory at CSU. Dr. Wall has received this award in recognition of her outstanding contributions to the study of soil ecology and the ecosystem services that soils provide, and for her extensive efforts to convey the importance of soils for current environmental, economic and conservation concerns. The author of more than 200 scientific publications, Dr. Wall is a preeminent global authority on the structure and function of soil ecosystems, the services that these ecosystems provide, and the potential effects that human activities have on the ability of soils to deliver these services. Much of her work has focused on nematode ecology in soil communities—research conducted in collaboration with scientists studying biological, physical, and chemical aspects of soil biology. Indeed interdisciplinary collaboration is a hallmark of Dr. Wall’s success in understanding soil as a complex biological system rather than a collection of disparate, unrelated parts. Her research has addressed nearly every aspect of soil biodiversity from basic biology and ecology to anthropogenic effects on soil biodiversity and its implications for soil fertility and soil ecosystem services. Dr. Wall’s interest in nematodes was sparked by her undergraduate work on nematode parasites in birds and horses. She earned her Bachelor of Arts degree in Biology at the University of Kentucky and continued there for her doctoral dissertation, studying nematodes that infect plants and earning her Ph. D. in 1971. A few years later, Dr. Wall moved to University of California-Riverside to begin the research that would define the rest of her career: biological diversity and function of soil ecosystems. Her initial foray into soil ecology was in the hot deserts of the Southwestern United States. One important result from this work was that, even in this simple soil ecosystem, soil biodiversity changed over relatively small spatial scales. Communities found beneath one desert plant were usually significantly different than those found beneath another. Such biological heterogeneity would also be found in most other communities studied by Dr. Wall, even those that appear completely homogenous above-ground like agricultural fields. In addition to her seminal work in Antarctica, Dr. Wall and her collaborators and students have studied soil ecology and biodiversity on all seven continents and in most major habitats, including deserts, forests, grasslands, agroecosystems, and cities. The overwhelming conclusion? Soil ecology matters and it matters in ways that could directly affect humans. Biodiversity of soil ecosystems influences how well ecosystems function and how resilient they are to human disturbance, including climate change. The exemplary quality, breadth, and depth of her work have earned her a reputation as the most influential soil biologist working today. An important aspect of Dr. Wall’s research is the role that soil organisms play in global carbon cycling, a critical concern in our warming world. Below-ground carbon stores are immense, more than double that found in the atmosphere and above-ground biomass combined. Thus, it is imperative to understand the ecology of these habitats to better model the fate of carbon in the environment. Healthy soil ecosystems regulate the rate at which carbon cycles through the environment. Organisms in soils convert dead animal and plant material into carbon-containing compounds that are released slowly into the atmosphere, effectively storing carbon below-ground. Dr. Wall’s research has shown that nutrient cycling in soil ecosystems is affected by species diversity, community structure, and environmental variables like precipitation and temperature. Understanding the dynamics of nutrient cycling, including carbon, will improve our ability to face the challenges of global climate change, soil degradation, soil loss, and desertification. Soils, of course, also play a critical role in agriculture. More than 15% of the world’s soils are considered degraded and each year land previously considered unsuitable for agriculture is converted to farmland. Dr. Wall’s research shows that losses of below-ground diversity can affect soil function, especially in arid environments with low soil biodiversity. As more marginal (and often arid) land is pressed into agriculture, loss of soil function could affect human health by affecting the production food, fiber, and fuels. Dr. Wall has also made a reputation out of embracing the role of scientists in our society. She has been in the forefront of efforts to encourage scientists to engage the general public about science and its implications for environmental and social issues. To help scientists learn these skills early in their career, she established the Sustainability Leadership Program at Colorado State University. Living by example, she has been tireless in her own efforts to raise awareness of the importance of soil biology for healthy ecosystem function and human environmental and economic health. Dr. Wall began her academic career at UC-Riverside as a postdoctoral researcher in 1972; she joined UC-Riverside as an Assistant Research Nematologist in the Department of Nematology in 1976. She worked at UC-Riverside for the next seventeen years, advancing to the position of Professor in the Department of Nematology. During this time, she also served two years as the Associate Director of the Drylands Research Institute and one year as an Associate Program Director at the National Science Foundation in Washington, DC. Professor Wall left UC-Riverside for Colorado State University in 1993, taking on the roles of Professor in the Forest, Rangeland, and Watershed Stewardship Department (1993-2006), Director of the Natural Resource Ecology Laboratory (1993-2005), and Associate Dean for Research at the College of Natural Resources (1993-2000). In 2006, Dr. Wall became a Professor in the Department of Biology at CSU, a position she still holds. She was instrumental in establishing the School of Global Environmental Sustainability at CSU in 2008 and has served as its director since its inception. Dr. Wall has received numerous awards and honors, including the 2012 Mines Medal from the South Dakota School of Mines and Technology, the Scientific Committee for Antarctic Research President’s Medal for Excellence in Antarctic Research, and the Soil Ecology Society Professional Achievement Award. She was named a University Distinguished Professor at Colorado State University in 2009. She is a Fellow of the American Association for the Advancement of Science, the Ecological Society of America, and the Society of Nematology. In 1999, Dr. Wall was named a Fellow of the Aldo Leopold Leadership Program and now serves on its Advisory Board. She was selected as the 2012 Tansley Lecturer of the British Ecological Society and has presented numerous invited lectures nationally and internationally. She holds an Honorary Doctorate degree from the Utrecht University, The Netherlands. Wall Valley in Antarctica was so named in recognition of Dr. Wall’s work in the continent’s Dry Valleys. Dr. Wall has helped set priorities for scientific research and policy through her work with a variety of influential organizations including the US Antarctic Program Blue Ribbon Panel, the United States National Commission of the United National Educational, Scientific, and Cultural Organization (UNESCO), the Scientific Committee on Antarctic Research, the International Ecology Institute, the Board of Directors of the World Resources Institute, the DIVERSITAS International Biodiversity Observation Year, the Scientific Committee on Problems of the Environment (SCOPE), the Millennium Ecosystem Assessment and the Polar Research Board of the National Research Council. 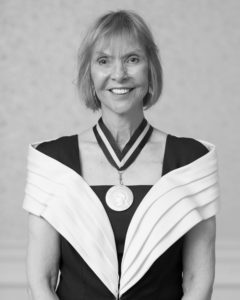 In recognition of her service to the National Research Council, she was made a National Associate of the National Academy of Sciences. She has served as President of six scientific societies, including the Ecological Society of America, the American Institute of Biological Sciences, the Society of Nematologists, and the Association of Ecosystem Research Centers. Even among presidents of these societies Dr. Wall is outstanding: In 2003, she was the Chair of the Council of Scientific Society Presidents.